As technology continues to advance, consumers seek new ways to become more efficient, productive, and connected with all aspects of their daily life. 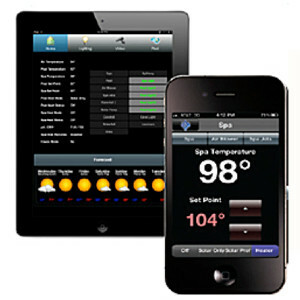 This desire to apply technology to everyday tasks extends throughout the home and to the outdoor living space as well. Swimming pools, water and fire features, misting systems and more are all becoming integrated into home automation systems. “Over the past 5 years, we’ve seen some incredible advances in the swimming pool market, both in the aspect of day to day operation and maintenance and to integrating our pools into home automation, iPhones, and more,” claims Chris Griffin, owner of UNIQUE Landscapes & Custom Pools. “Our clients now want their pools to be as current as their smartphones. We offer many solutions which connect our swimming pools and spa with today’s cutting edge technology”. Here are the top 6 items to include in any UNIQUE new pool, spa, or remodel. WATER FEATURES – The Pentair Intelliflo VS provides homeowners the ability to control the perfect flowrate for a water feature. You can create the perfect gentle waterfall to enhance the ambiance of a quiet evening or increase the flow for more of a WOW effect. The choice is yours and this pump turns a single water feature into a feature with unlimited options to suit every event in your outdoor living space. SPA JETS – Consider the therapeutic effects of being able to control the massaging ability of your spa jets. On low the jets provide a perfect gentle massage to relax and rejuvenate after a long day. Medium will offer more water motion and a slightly stronger massage. And set on high, the jets are the perfect answer for aching muscles after a hard workout or an extremely strenuous day. Now all of these options are right at your fingertips thanks to your variable speed pump. 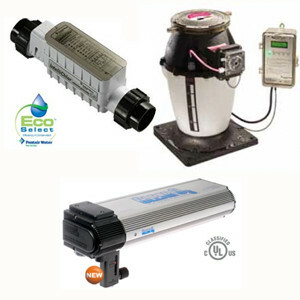 FILTRATION & CLEANING – The true financial value of this pump becomes clear when it is run for pool filtration. This can be done at a very low speed which is providing you with a much more efficient cleaning mode. When operating at this lower speed it is filtering at a fraction of the cost as a conventional 1HP or 2HP pool filter pump. This concept is similar to driving an eight cylinder vehicle to the grocery store vs. a four cylinder vehicle on the same trip. Both vehicles get you to the store in the same amount of time but the four cylinder motor is doing that same job much more efficiently and therefore at less of an expense. 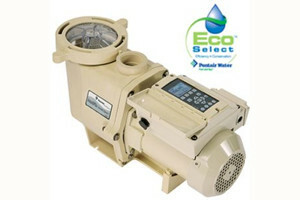 Your variable speed pump provides this same benefit when filtering and cleaning your pool. 24 HOUR SKIMMER – One of UNIQUE’S special features, which is included in our premium pool package, is the ability to skim your pool 24 hours a day using around 200 watts of power. That is about the same energy consumption as 3 light bulbs, and we include this awesome benefit in all UNIQUE feature pools. This benefit is just another reason to purchase only a Pentair Intelliflo VS pump. This constant cleaning mode ensures that your pool is always ready for use and at a fraction of the cost of some other cleaning methods. Ask your UNIQUE Pool Designer for details, as this is a feature that only UNIQUE has perfected! 2) Infloor Cleaning System– Having a clean pool has never been easier than using Paramount’s PCC 2000 cleaning system. When installed properly, Paramount offers a 99% cleaning guarantee or your money back. The only way to clean every aspect of your pool on a daily basis is with this system. UNIQUE has become a leader in the pool industry because of our ability to perfect this infloor cleaning system, and Paramount makes it easy for us to put this unbelievable guarantee behind every system we install. “We find that cleaning systems have gotten a bad name, and you will find many of our competitors who try to talk clients out of these systems for some reason or another”, says Chris Griffin owner of UNIQUE. “I have to chuckle a bit, since I truly believe that one would be making a mistake by NOT building a pool that cleans itself! Think of it, a clean pool, all the time, without any vacuums and hoses which don’t clean the steps and benches in a pool.” UNIQUE installs a cleaning system in almost 90% of all pools that we build and our customers could not be happier with their investment and the quality of the cleaning system in their pool. 3) Salt Chlorinators/Ozone/pH Management – Many consumers have heard of a saltwater pool but they are not really sure what the term means. Saltwater pools generate their own chlorine through a chemical process and ozone sanitizers make it possible for these pools to use less chlorine. The issue with saltwater pools however is that salt has a natural tendency to raise the pH level of the pools. The solution for this is that owners must add acid to their water to offset this pH increase. “Maintaining a pool’s pH is one of the most important factors in water chemistry”, remarks Mr. Griffin, “This is usually a large contributor to the scale problems in many pools, as well as many other issues. We teach our clients to understand water chemistry, but it is really a lot of work to add acid daily.” In an effort to eliminate this issue for pool owners, Pentair has created an incredible system which dispenses acid based on the amount of chlorine produced by the salt cell. “It is a great system, and priced very reasonably for the value it offers to our clients,” explains Griffin. “This system can be added to new or existing pools, and personally, I wouldn’t want a pool without these three features – IntelliChlor, Clear O3 & IntellipH”. In addition, if you are considering a saltwater pool, it is important that you understand the damage saltwater can cause to many natural stone surfaces such as flagstone, cantera stone and even travertine pavers. When installing a saltwater pool it is always a good decision to protect your patio with a saltwater resistant sealer. 4) iPHONE APP – Remote controls are a thing of the past thanks to Pentair’s Screenlogic 2. This device connects any iPhone, iPad, or desktop computer to your pools features for instant and easy access. This is the perfect feature to use as you are headed home after a long day of work. A simple click of the app and your spa is instantly on and heating to the perfect temperature and will be ready for you as soon as you get home. This technology gives our clients instant access from anywhere in the world with internet, smartphone, or desktop computer. “It’s just an easy to use, easy to program, and easy to understand system”, boasts Griffin, owner of UNIQUE Landscapes & Custom Pools. 5) IntelliCHEM by Pentair – Most homeowner’s biggest concern when installing a swimming pool is the constant care and maintenance which many pools require. Homeowners want to enjoy a dip in their pool and not be trying to recall high school chemistry to keep the pool water balanced. But infloor cleaning systems and Pentair’s IntelliCHEM system can eliminate these concerns. 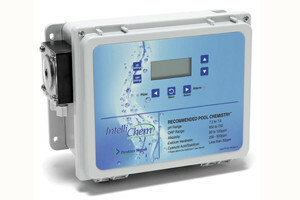 The IntelliCHEM system actually makes water chemistry easy by testing and dispensing chlorine and acid as needed. Now homeowners are free to truly enjoy their pool and spa without the hassles of worrying about water PH and chemistry. Griffin ads “This is the best system for any pool owner who wants to make the extra investment and eliminate a lot of the daily work of owning a pool. This system creates the pool that takes care of itself.” The IntelliChem doesn’t totally replace the need for supervision to a pool as no machine is capable of replacing human interaction, but it drastically reduces the daily & weekly upkeep. 6) BULLFROG JETPAKS – There is always a difficult decision to be made for UNIQUE pool buyers. It is the choice between the traditional “hot tub” and the more therapeutic “Jacuzzi”. A “hot tub”, is just a body of water which gets hot, and may have 5 to 6 jets. It is easily integrated with the swimming pool, it looks nice and it is easy to maintain as it is part of the pool. Hot tubs are not great for therapy, but they provide a warm place to soak in water and relax. If you are looking for a more therapeutic place to relax then a Jacuzzi is more likely to suit your needs. Jacuzzi spas can have as many as 100 jets, bubbles, and other features. With the invention of the Bullfrog JetPAK, homeowners can have the convenience of the hot tub with the therapeutic action of a Jacuzzi spa. Ask your UNIQUE designer to explain all of the great features and benefits of including a JetPAK in your spa design. JetPAKs are usually installed in pairs, and come in many different colors & configurations. Be sure to carefully consider the benefits of the JetPAK for your new spa because they are VERY difficult to add to existing spas, and are more suited for new builds.